Mountains, via their seasonal snowpacks and other cryospheric reservoirs, are the “water towers of the world.” In the western United States, 50-80% of the water supply descends from the sky in the form of seasonal mountain snows. Globally, more than a billion people depend on the snow system for water supplies. Climate change researchers around the world have recognized mountains as a sensitive bellwether of global change, where system responses quicker to present than in lower elevation urbanized or rural settings. Understanding the seasonal delivery and distribution of mountain snowcover the snowpack storage and release of water, and the effects of climate on those processes, are clearly of increasing importance to the American West and to snowmelt-watered regions everywhere. 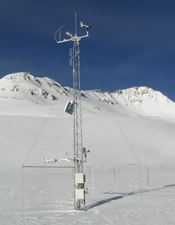 The CSAS established and operates the Senator Beck Basin Study Area as a purpose-built mountain system observatory in an alpine headwater catchment of the Uncompahgre River at Red Mountain Pass, in the western San Juan Mountains of southwest Colorado. Senator Beck Basin is located in a critically wet and cold portion of the Colorado River Basin. The study area’s location high in the first major mountain system downwind of the desert Southwest and Colorado Plateau enables monitoring of the impacts of regional warming, drought, changes in precipitation phase, and other emerging mountain processes such as dust-on-snow and spruce/fir forest die-off. Senator Beck Basin is also near headwaters of the Rio Grande River Basin. 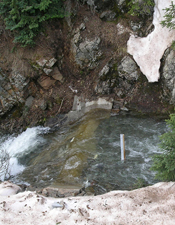 Four arrays of continuously operated monitoring instrumentation and infrastructure, including a stream gauging station, are operated by CSAS at Senator Beck Basin (SBB). 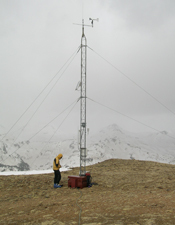 Year-round automated measurements are complemented by other manual measurements in routine time series. Senator Beck Basin data are open-access and constitute the foundation for the science that CSAS conducts and for the research we host and support. Serially complete SBB datasets for hydrologic modelers were recently published in Water Resources Research, providing an important new platform for snow hydrology model development and testing. Archived SBB datasets and their associated metadata are also published on the CSAS website after each water year, in several formats, along with more frequently updated graphical summary products. CSAS also posts real-time data from each of the four SBB study plots. 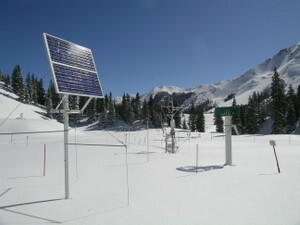 Senator Beck Basin is the primary sentry site for the CSAS’s Colorado Dust-on-Snow program (CODOS), an applied science program for water managers. See: www.codos.org. Long-term monitoring requires sustained effort and funding. In addition to governmental support, CSAS is receiving support from “Citizen Funders” who also underwrite this important science mission.